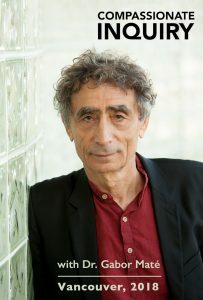 Experience Compassionate Inquiry with Dr. Gabor Maté in this recording of a 2-day workshop. This series of 4 videos, totalling 9 hrs and 25 minutes, was filmed Jan 25-26, 2018 in Vancouver during a 2-day workshop on Compassionate Inquiry. Dr. Maté models the process of Compassionate Inquiry with course participants and instructs therapists in the practice of this powerful technique to help clients access deep healing and transformation. Click the button below to access the entire two-day seminar.